Bristol, VA June 26, 2012 – Conversations with Sharks has been coined the book for entrepreneurs. The book’s author Kelly Cole got inspired to write the book after watching the first episode and realized he had filled up a whole note book with business nuggets and negotiation tactics. He then decided it would be a great idea to write a book and to also interview the Sharks. He then began to reach out to the sharks and ended up interviewing two of them, Barbara Corcoran and Daymond John. 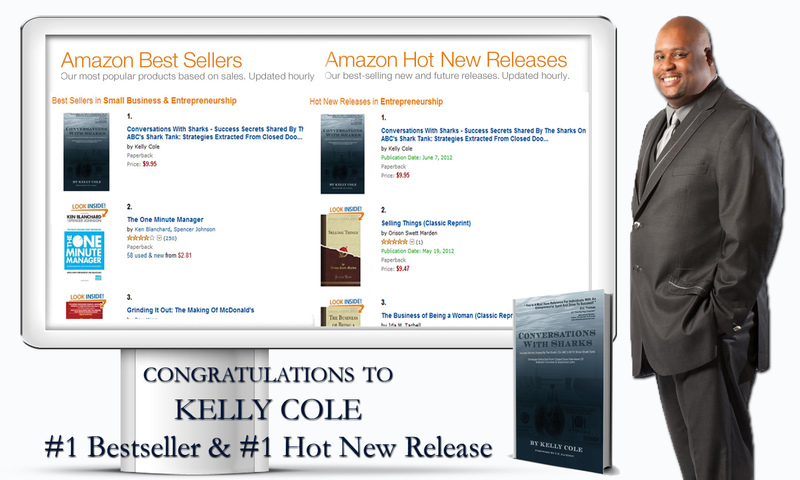 Kelly is pleased to announce that “Conversations With Sharks” hit #1 on Amazon’s best sellers list on its release day. And it remained in the #1 spot for two days. Conversations With Sharks hit #1 in several other categories on Amazon including the Hot New Release category and The Most Gifted item category. Conversations with Sharks is filled with the keys to success in life & business. Inside the book Kelly covers topics such as The 3 P’s – Person, Profit, and Product, Barbara Corcoran’s Rule of 5 Theory – “If you try five ideas, you’re going to get one that’s a winner. You can guarantee it! But if you get five ideas and move on one, you’ve got to now have twenty-five new ideas to get a winner.” Daymond John’s Key to Negotiation, and what type of business would be great to start now, plus so much more. You can meet Author Kelly Cole and learn first-hand how must he learned from his conversations with sharks on his upcoming book tour in Bristol TN, Chicago and Atlanta, GA. Saturday, July 14, 2012, Cole will be at Word Of God Mission Church in Bristol, TN at 3pm. His tour continues in Chicago and Atlanta dates and times TBA. Kelly is available for interviews, book signings and speaking engagements.